How to make a local trail, directly networked to the O’Keefe Rail Trail in North Bendigo, a whole lot safer? Thanks to the efforts of the City of Greater Bendigo staff and Councillors, the Bendigo Creek Trail has recently been re-routed under the High Street bridge plus the trail approaches upgraded in Golden Square. 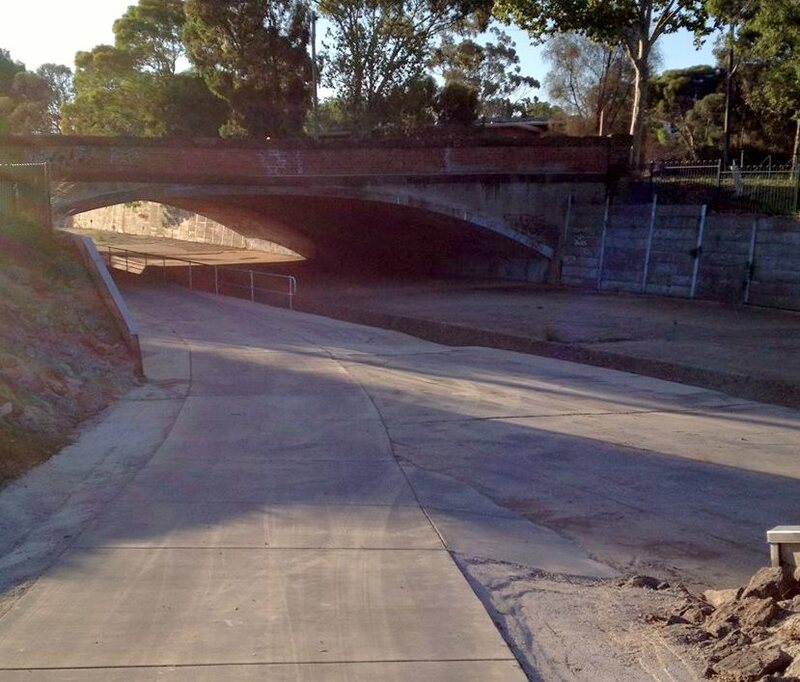 The Bendigo Creek Trail’s new High St bridge underpass at Golden Square. Not only have these works eliminated a dangerous high risk crossing of High Street, with minimal vision distance for all users, it will benefit and encourage more local cycle commuters riding to work. This popular trail will also now provide cycling and walking tourists in Bendigo with a much safer experience to talk about. Congratulations to the City of Greater Bendigo, for listening and eliminating this dangerous crossing. The cycling community now looks forward to Council and State Government addressing the Bendigo Creek Trail’s number one safety hazard and impediment, that being the crossing of the Charing Cross-Alexander Fountain area in the Bendigo CBD.